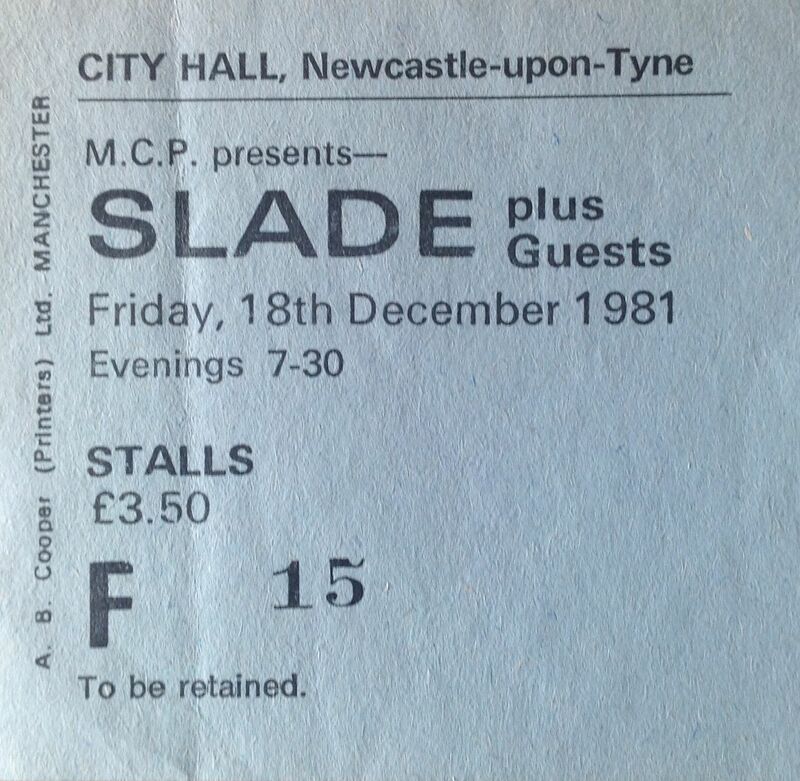 The last time I saw the original Slade line-up live in concert was at Newcastle City Hall on 18th December 1981. Slade were where they should be, performing to sold out concert halls up and down the country. It was great to see them back at the City Hall, Slade were very clearly enjoying themselves, and it being close to Christmas festivities, of course they played that song. We were a few rows from the front, and my ears were ringing for days afterwards. 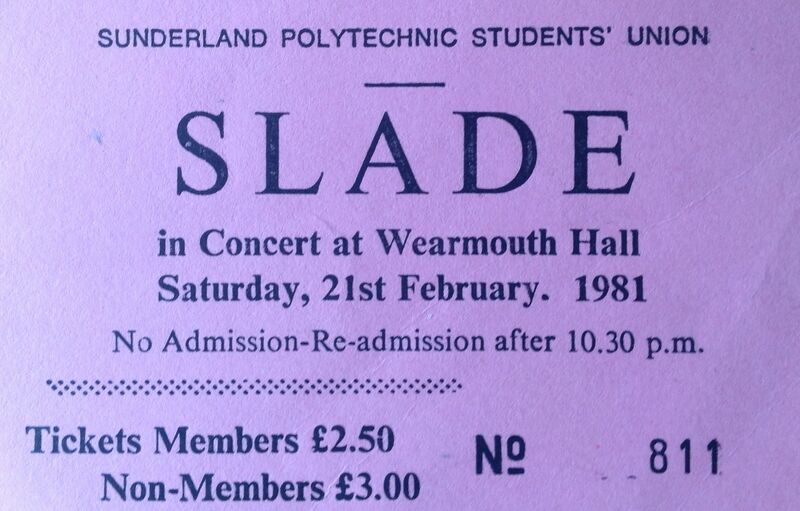 Slade played a couple of more times in the north east, at Newcastle University in 1982, and on 17th December 1983 at Durham University. It is possible that I was at the Durham gig, but without a ticket or programme I can’t be sure. I do have vague memories of seeing Slade there, but I think it may have been in the 1970s. On 18th December 1983, the night after playing in Durham Slade played the Royal Court Theatre, Liverpool, which was to be the original band’s last ever full UK show. 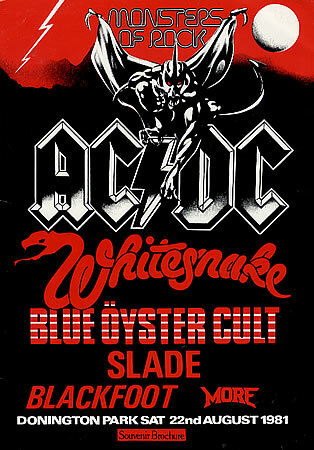 A UK tour was scheduled for 1985, but was cancelled. That concludes my Slade memories, which I’ve enjoyed writing. 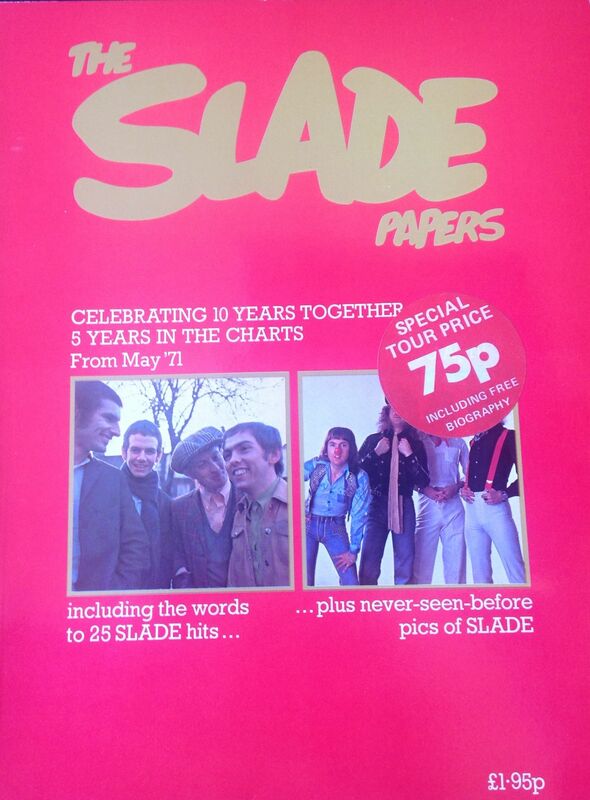 Looking back makes me realise just how great a rock band Slade were, and how important they were to me. I’ve seen the “new” Slade a couple of times recently, and may go to see them again one day. They put on a fun show, but it just isn’t the same without Noddy and Jim (sorry Dave and Don). Now a reunion of the original band would be something to see 🙂 but I guess that’s not going to happen. The “Live at Reading” EP reached number 44 in the UK singles chart; the band’s first chart placing since 1977. 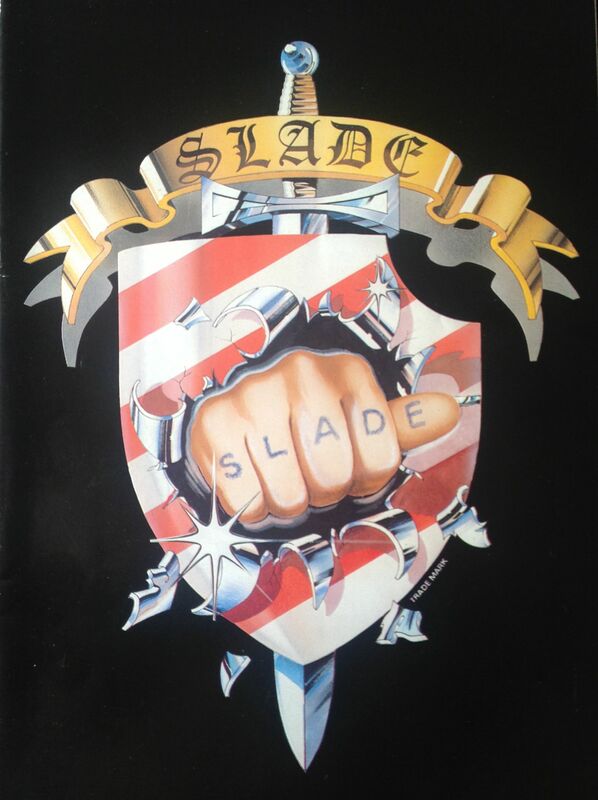 Polydor Records seized the opportunity to capitalise on Slade’s recent success and released a compilation “Slade Smashes!” in November 1980. The album was a big succees, turning a whole new audience onto Slade; it spent 15 weeks in the UK chart, was certified Gold, and sold over 200,000 copies. Success continued with the release of their new single “We’ll Bring the House Down” which was released in January 1981. 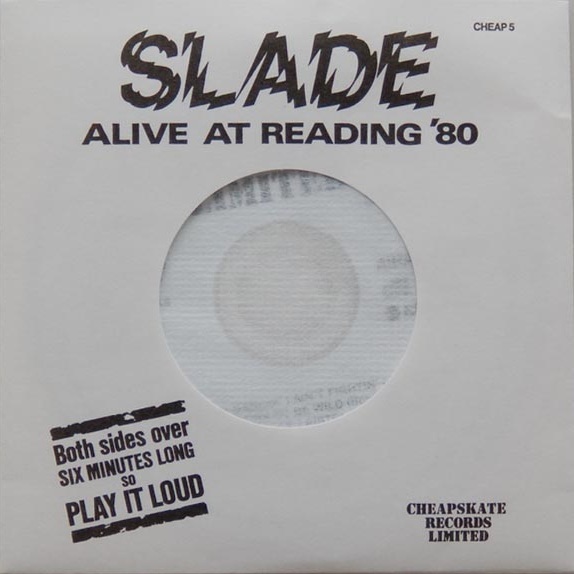 Aimed at the new heavy metal audience who had picked up and them at, and after, Reading 1980, it was a bit heavier than their normal sound.”We’ll Bring the House Down” got to number 10 in the UK singles chart, and became Slade’s first top ten hit since 1976. Slade were starting to fill concert halls again, and toured relentlessly throughout 1981. The next time I got to see them Live after Reading in August 1980, was 6 months later at a sold-out gig at Sunderland Polytechnic’s Students Union dance at Wearmouth Hall on 21st February 1981. The place was ram packed with students and heavy rock fans who gave Slade the returning heroes welcome that they deserved. It was great to see them back filling halls again, and you could tell how much Noddy, Dave, Jim and Don were enjoying their newly found stardom. 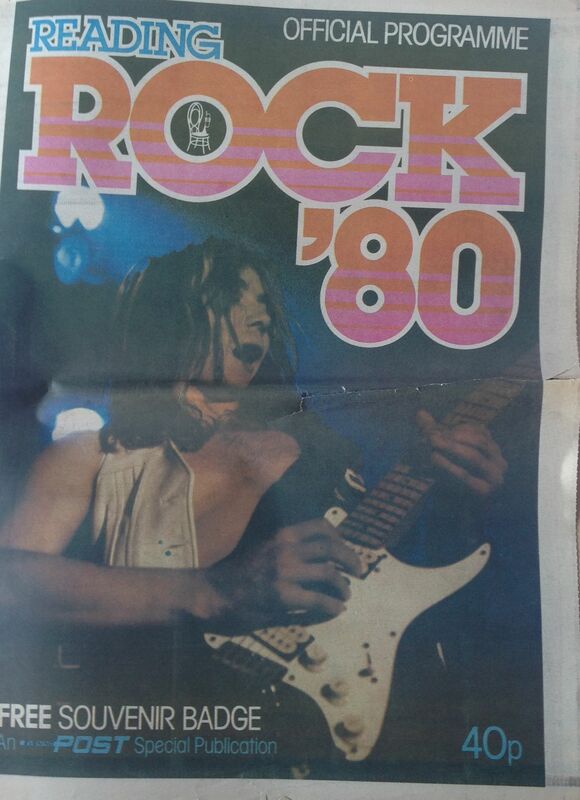 By 1980, Reading Festival had become a heavy metal extravaganza. 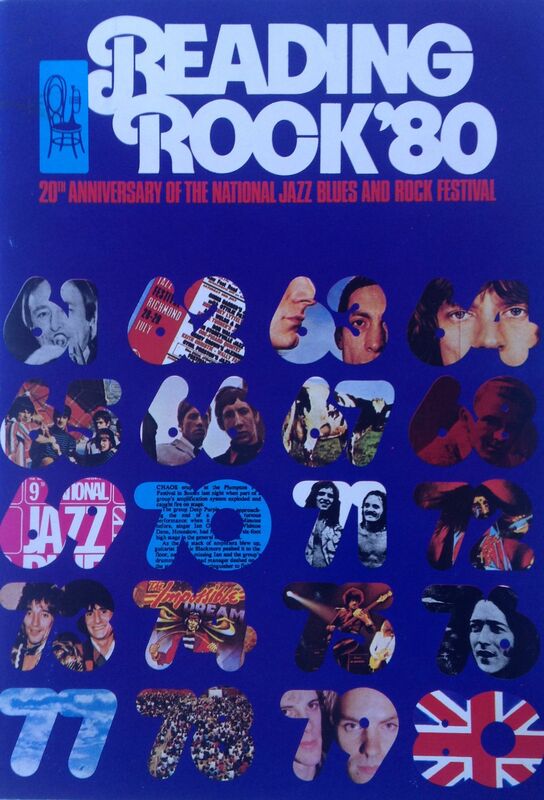 Headliners were Whitesnake, UFO and Rory Gallagher, with a full supporting heavy rock cast including new up-and-coming NWOBHM bands Def Leppard and Iron Maiden. Metal legend Ozzy Osbourne was billed to play on the Sunday with his new band Blizzard of Oz, but rumours started to go around the festival site, that Ozzy wasn’t going to show. Soon those rumours started to hint at who might replace Ozzy, and the name in the frame was…wait for it….Slade. At first this seemed implausable. Slade were out in the “wilderness”, playing in small clubs. How would a staunch heavy metal crowd react to them? The festival organisers wouldn’t take the risk, would they? But the more I thought about it, the more I began to hope that it would happen, and the more I began to think it might really work out well for Slade. After all, I’d seen a similar thing happen eight years before at Lincoln, when Slade turned around a potential disaster and secured themselves a special place in the heart of rock fans. I had no doubt that they had the ability, the songs, the passion and the supreme rock’n’roll sensibilities and credentials to do the same again. I’d seen them play Middlesbrough Rock Garden a couple of months earlier, so I knew that Slade were performing well, powered on all of four cylinders, and ready to rock. And if anyone had the bottle to face the Reading crowd, and a potential shower of Party Seven cans, and talk them round, it was Noddy. I think it was on the Saturday night that DJ Bob Harris (or it may have been John Peel; they were both there) confirmed that Slade would be replacing Ozzy, to massive boos from the crowd. Slade, those guys who sing the Christmas song? How could they replace a metal legend like Ozzy? The crowd was having none of it. I’m sure many were already plotting how they were going to show Slade exactly what they thought of them. This would no doubt involve lobbing cans at the stage, and probably filling them with piss first. Sunday afternoon came. 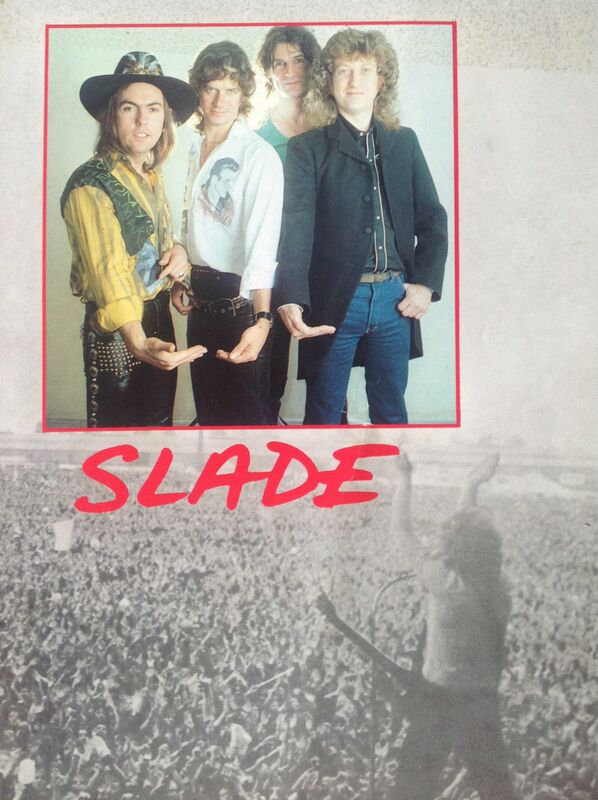 Slade were to appear after glam heavy metal band Girl, and just before new heroes Def Leppard. My mate Dave and I were willing it to work out. The field wasn’t that full as Bob Harris announced that Slade were taking the stage. Their entrance was greeted with a hail of cans. Noddy wasn’t phased at all by that, and asked everyone if they were “ready to rock”. And then they launched straight into “Dizzy Mama”. And then it started to happen. Slowly at first, the crowd began to cheer. People wandering around the outskirts of the site started to run towards the stage. Slade knew they had to win the crowd over and were working so hard, rocking so hard, and playing the hits. The area around the stage was soon completely rammed and the whole field was going crazy. Amazing. Slade nailed it, and in the space of one hour made sure that they were well and truly back. I had tears in my eyes. The event was recorded and a few tracks were released as an EP. For their next tour, Slade were back in concert halls, and were filling them. But….I got back to the camp site after Whitesnake and discovered that someone had nicked my tent 😦 Oh well, you can’t win them all. It was a cheap crappy tent anyway. Thanks to Andrew King for allowing use of his image of Slade onstage at Reading, through the Wikimedia Commons licence. The Rock Garden was a scary place. If the skins didn’t get you, then the rock garden burgers would almost certainly finish you off. A visit to the Rock Garden was an experience not to be forgotten; a fight or two was guaranteed as part of the evening’s entertainment, alongside performances by some of the finest punk or heavy rock bands around at the time. Slade were on their never ending tour of clubs, pubs, cabaret and ballrooms in 1980. The years between 1977 and 1980 were their “wilderness years”; at the time Slade were down on their luck and receiving next to no money. Their records were no longer making the charts and they were forced to play small halls and clubs around the UK, their only income coming from royalties from the old hits, most of which will have gone to Noddy and Jim, as the band’s two songwriters. Their single releases from this period were not their best and included “Give Us A Goal” and “Okey Cokey”. Nuff said. But live in concert they were as great as ever, perhaps more so as they fought and played hard to win new fans and to win back their place in the charts. The Rock Garden was packed with skinheads for Slade. My mate Norm has vague memories of the support act being pelted off stage, and having to hide behind the bar while the skins continued to throw handfuls of ice at them. But the skins loved Slade, and Noddy managed to keep them in order. When a scuffle broke out he would tell the hard guys to behave and they would listen to him and take notice. They saw him as one of their own. The Rock Garden stage was tiny, and Slade came with masses of amps, which they still had from the days when they would pack out big halls. So Nod, Dave, Jim and Don were limited to playing in a tiny area in front of a massive back line and surrounded by big PA speakers. And they were deafeningly LOUD. I swear my ears were ringing for days afterwards. The set was a mix of their hits, recent tracks and a few covers. The place went crazy. Slade were called back for several encores and finished with “Born to be Wild”, just like old times. Happy days. “Seats and brass rails were smashed and twisted at the Sunderland Empire last night, as rock group Slade worked a young audience to fever pitch. House manager, Mr Ron Jameson said today that the cost of the damage had not yet been counted, but it was expected to run to hundreds of pounds. 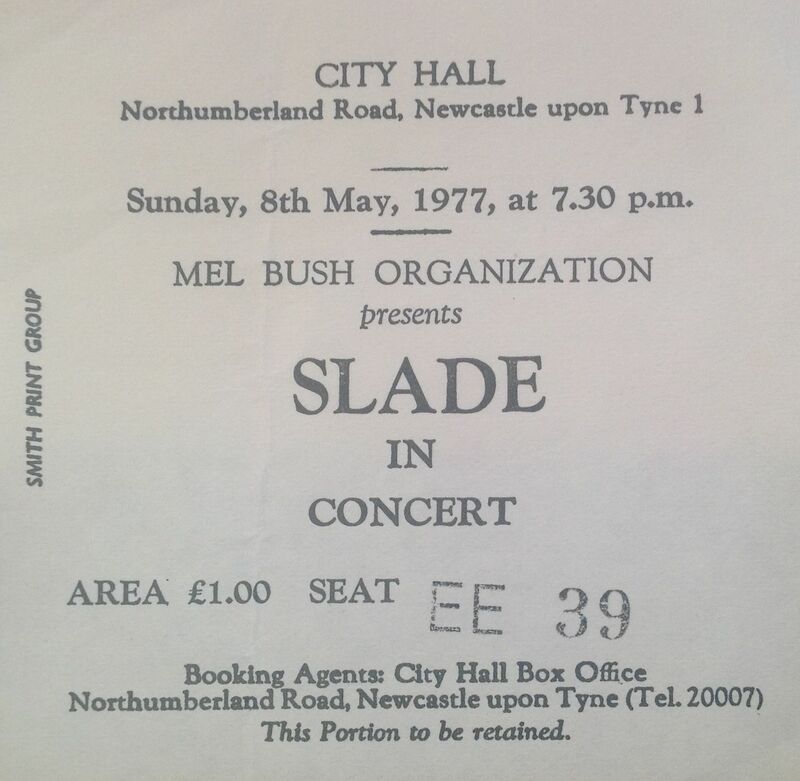 The next time I saw Slade was at Sunderland Empire, a gig which ended with serious damage to the first few rows of the seats. Support came from local rockers Geordie. I was quite close to the front, with a group of mates, and we watched the first few rows of seats collapse under the weight of fans pushing, shoving and generally going crazy. By the end of the concert all that was left of the first five or so rows was a pile of smashed up wood. The same thing happened at a Boomtown Rats gig around the same time. My ticket for the gig looks a bit of a mess. 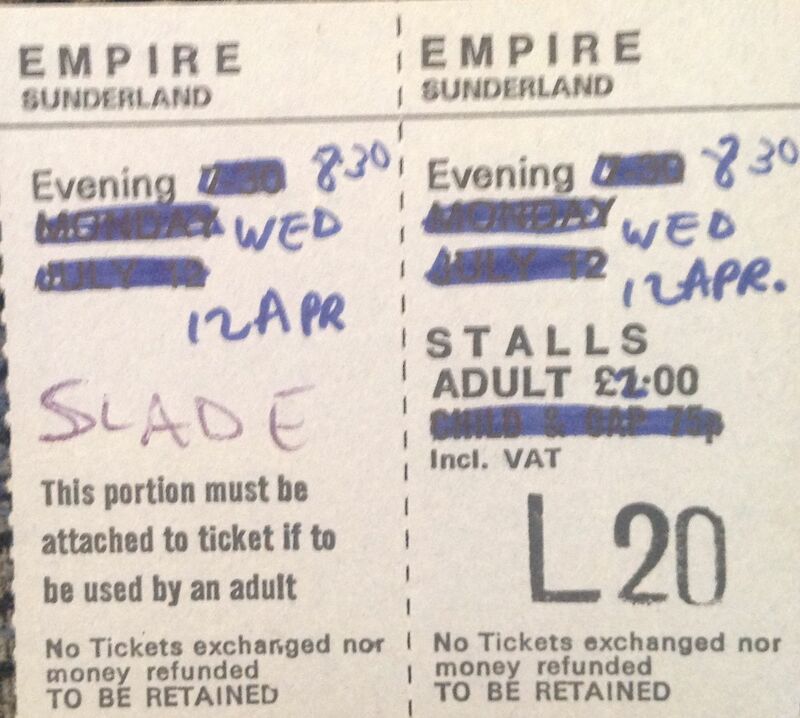 I have written “Slade” on it (at the time the Empire tickets didn’t list the act who was playing) but the change of date was done by the Empire when we bought the tickets. It looks like they were reusing some tickets from another night! Slade went further into the wilderness in 1979, playing cabaret and residencies at Baileys Nightspots up and down the country. The next time I saw them was another wild night, at Middlesbrough Rock Garden, which I’ll write about tomorrow. Slade had been away too long. They’d been over in America working the US market, and had taken their eye off the ball in terms of their home fans. As a result their popularity was waning. They realised this, and in early 1977 Slade came back home to England and recorded their sixth album “Whatever Happened to Slade?” The album was a return to their rock’n’roll roots, and received positive critical reviews, but failed to make the UK album charts. Musical tastes were changing in the UK, the glam craze had passed, “dinosaur” or “old fart” bands were being passed over for new bands, and the fashion of the day was “punk rock”. Some of us could see the similarities between the rawness of punk, early Slade, and their original skinhead image; however to the majority of the music public Slade were a forgotten band; a thing of the past. From a review of the time: “But poor old Slade have blown it, have they? Oh no…..The music suggested havoc. It was sensational: a riff as pile driving as anything Quo have produced with the distinctive fuzzed, rough texture of the Slade guitars and a hint of American funkiness working through. Compulsion……I could hardly believe it….Dynamics, dynamite….The crowd……were on their feet and singing ‘The Blaydon Races’ while Noddy in total friendly rapport squawked away like a cross between Mr Punch and schnozzle Durante….. 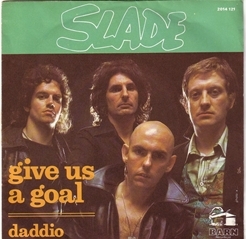 I expect Slade will be the Status Quo of 1987.” (Phil Sutcliffe, Sounds, May 1977). Yes, Slade were playing excellently, but it was a few years before they would rebuild their fan base and return to the charts. During the period between 1977 and 1980 Slade entered their “wilderness years” playing up and down the country in clubs, dives and cabaret. I attended a couple more great Slade gigs during those wilderness years, and will reflect on them over the next couple of days.